A member of the lab using an ellipsometer. New nanomaterials could enable a new generation of energy-saving and renewable energy technologies like organic light-emitting diodes, solar cells, and photovoltaics. Meanwhile, thin films of other novel materials like superhard nanodiamond and cubic boron nitride could significantly improve high-precision machining and cutting tools. 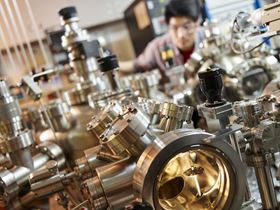 The City University of Hong Kong, in particular the Center of Super-Diamond and Advanced Films under the leadership of Chun-Sing Lee, has focused research efforts in these areas and is the only institution in Hong Kong that can manufacture market-ready OLEDs. 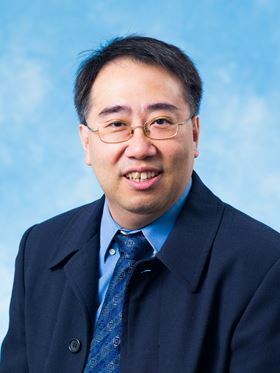 In addition to his research efforts, Chun-Sing Lee serves on the editorial board of numerous journals and recently established a new publication, Materials Today Energy, with Elsevier. In the early 1998, COSDAF was launched as a university research center. We have nine core members and over 40 research staffs and students. Our center mainly works on three types of materials: (i) diamond and other carbon materials; (ii) organic optoelectronic thin films; and (iii) various nanomaterials with particular attention to their energy, environmental, and biomedical applications. When we decided on our research focus, two selection criteria were considered. Firstly, we would like our research to be useful to Hong Kong and the surrounding regions. Meanwhile, on the other hand, we will also want to carry out fundamental research that has no immediate applications. In this case, we only select topics where we have an edge internationally. When COSDAF was first launched, the research focus was on diamond and other super-hard thin films (e.g. cubic boron nitride). We soon noticed increasing interest in different nanomaterials and that the equipment we used for growing diamond thin films could be used for growing these nanomaterials. In the late 90s, we were one of the first groups to report large-scale synthesis of silicon nanowires. In 2000, we realized that there was rapid development in organic light-emitting diodes (OLED). At that time, OLEDs were expected to take over some portion of the low-end liquid crystal display (LCD) market, of which Hong Kong had a significant market share. We started to work on OLEDs with the aim of establishing know-how in Hong Kong in case the technology took over the low-end LCD market. Since then, COSDAF has been working on three types of materials: diamond, organic semiconductors, and various nanomaterials. As I mentioned, COSDAF was one of the first laboratories reporting the synthesis of silicon nanowires and their surface nanostructures . Our work was the first to show that the crystal structure of silicon can be maintained even when the nanowire diameter is just 1 nm. We also explicitly showed that the band gap of silicon widens when the diameter of the nanowire is less than 7 nm. Since the late 90s, we often observed nanowire growth with periodic structures with no clue to where the periodicity originated. We recently found that such periodicity can be described with a very simple mathematical description, which appears to be general and work well for all examples we found in the literature. We also proposed a physical model to explain periodic growth by considering oscillation in the growth geometry due to nanometer size effects on the chemical potential. We all learned in secondary school that the pressure difference inside and outside a soap bubble is inversely proportional to the radius of the bubble. Imagine that when the bubble is nano-sized: there will be a huge pressure difference. In the case of nanowire growth, there is often a liquid sphere of catalyst at the tip of the growing nanowire. So, the radius of the nano-sized liquid droplet is significantly modulated by the pressure and chemical energy . On the other hand, our recent work on thermally activated delayed fluorescence (TADF) based on exciplex emissions has also attracted a lot of attention [3, 4]. In this work, we have demonstrated that the design principles for getting high-performance TADF OLEDs by using exciplexes formed between donor and acceptors molecules. 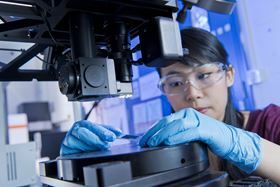 For synthesis and device fabrication, we have: a Cambridge NanoTech atomic layer deposition system; a high vacuum 3-zone tube furnace; a low vacuum single-zone tube furnace; a photolithography system in a class 100 clean room; an ULVAC multi-chamber deposition system in a class 1000 clean room; an UHV thermal evaporation system; an ASTEX ECR microwave plasma chemical vapor deposition (CVD) chamber; a plasma-assisted hot filament CVD system; a hot filament CVD system; a dual ion beam deposition system; an UHV magnetron sputtering system; and an UHV electron beam deposition system. For characterization of materials, we have: a Philips CM200 FEG TEM; a Philips XL30 FEG SEM; a VG ESCALAB 220i-XL UPS/XPS spectrometer; a Nano Indenter XP; a Renishaw Raman 2000 spectrometer; a Renishaw inVia UV Raman spectrometer with NANONIC NSOM and AFM attachments; a Nanoscope IIIa SPM; an Omicron (low temperature) UHV Multiprobe XP, SPM; a Woollam M-2000 ellipsometer; a MACCOR SERIES 4000 battery test system; an Oriel solar simulator; a PERKIN ELMER photoluminescence spectrometer; and a time-resolved photoluminescence spectrometer. Yes, I do have one. It is our VG ESCALAB 220i-XL UPS/XPS surface analysis system because I have been involved in all stages of its life: from writing the proposal for raising funding, custom-designing modifications for the system, in-field checking, launching, and finally operation. It is like my baby! The most important key is to attract good people. They will bring in funding, high quality research topics, good research staff and students. In the past couple of years, COSDAF has started to apply our new materials to biomedical applications. To increase our strength on this direction, two young researchers (Dr P. Shi and Dr H. Sun) have joined the Center as core members. Meanwhile, the Center also considers energy materials a very important research direction. In this area, the internationally recognized scientist, Alex Jen, has just jointed the Center to work on organic and hybrid materials for photovoltaic and other optoelectronic applications. D. D. D. Ma, C. S. Lee, F. C. K. Au, S. Y. Tong, S. T. Lee. Small-diameter silicon nanowire surfaces. Science 299 (2003) 1874-1877. H. Wang, J.-T. Wang, Z.-X. Cao, W.-J. Zhang, C.-S. Lee, S.-T. Lee, X.-H. Zhang. A surface curvature oscillation model for vapor-liquid-solid growth of periodic one-dimensional nanostructures. Nature Communications 6 (2015) 6412. X.-K. Liu, Z. Chen, C.-J. Zheng, C.-L. Liu, C.-S. Lee, F. Li, X.-M. Ou, X.-H. Zhang. Prediction and design of efficient exciplex emitters for high-efficiency, thermally activated delayed-fluorescence organic light-emitting diodes. Adv. Mater. 27 (2015) 2378-2383. X.-K. Liu, Z. Chen, C.-J. Zheng, M. Chen, W. Liu, X.-H. Zhang, C.-S. Lee. Nearly 100% triplet harvesting in conventional fluorescent dopant-based organic light-emitting devices through energy transfer from exciplex. Adv. Mater. 27 (2015) 2025-2030.